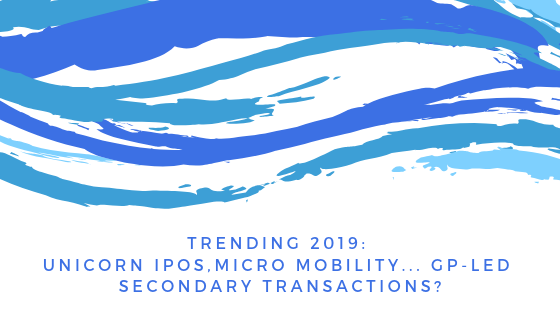 Trending 2019: Unicorn IPOs, Micro Mobility... GP-led secondary transactions? If we were tracking trending topics in the venture ecosystem in 2019, the recurrent themes would be dominated by unicorn IPOs and the viability of micro mobility. 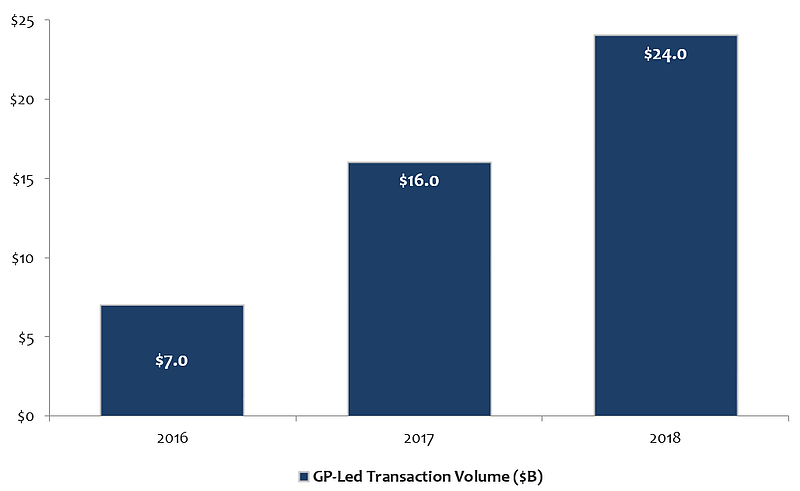 But at Greenspring, an internal trending theme has a much more esoteric focus: the recent wave of General Partner (“GP”) led restructurings. Considering this concept is not a part of mainstream venture capital vernacular, there are some obvious questions: what exactly is a GP-led transaction, why are managers recommending them to their investor base, how would a manager go about executing one, and what do they ultimately mean for our investment practice at Greenspring? Given we are currently in the midst of leading three secondary tender offers, two of which are full fund restructurings, we can conclusively state that we believe the GP-led secondary landscape has considerable growth potential. We are excited about the implications of this transition type for effectively serving the needs of both General and Limited Partners, not to mention our own investment strategy. The secondary market has experienced a renaissance in the last two decades. Mike Catts, Managing Director at Evercore, commented in a recent dialogue, “In the early 2000s, every secondary was plain vanilla, but fast forward to today, there are secondary specializations in niches we didn’t even know existed.” In the traditional secondary transaction of old, a buyer would purchase a single Limited Partner (“LP”) interest from an investor who wanted liquidity and assume that interest going forward. While this type of transfer remains commonplace, a vast landscape of secondary transaction options has emerged, driven in large part by the GP. Today, GPs are looking for creative ways to satisfy the liquidity needs of their investors, while also having structures in place to maximize the value of their portfolio companies in the face of increasing time to liquidity. To accomplish these goals, managers are creating a range of solutions that include features like extended hold periods, follow-on capital raises, enhanced recycling provisions, asset sales, asset transfers, and broader fund interest sales. Out of this group, three stand out as facets of the modern secondary landscape: continuation funds, tender offers, and asset strip sales. While we will focus on these core areas, the truth is that secondary transactions have, in many cases, become highly nuanced, creating an infinite amount of possibility based on each unique circumstance. Continuation funds are formed to transfer assets into a new vehicle with fresh terms backed by a mix of legacy investors and secondary buyers. A tender offer occurs when a buyer offers a set price in exchange for bundled LP interests in a fund, allowing existing investors the option to sell all or a portion of their remaining interest. An asset strip sale occurs when all or part of the existing portfolio is sold to generate cash to fund a distribution to investors or for recycling capital into value-driving unrealized investments. To bring these solutions to life, we have included some recent examples. The first example is an ongoing process in which Greenspring is serving as the lead investor in a large-scale, GP-led fund restructuring. The fund in question is unique, being over ten years old with a top-decile net multiple, and the vast majority of its value concentrated in three high potential unrealized companies. Recognizing the category defining-nature of the key remaining companies, our team collaborated with the GP to devise a path forward that serves the best interest of all parties. Through a tender offer, the existing investors have the option to sell all or a portion of their remaining NAV at a predetermined price and/or roll their remaining interest into a newly formed vehicle. The newly formed vehicle (a continuation fund) features a new five-year term to allow the remaining companies ample time to continue to grow and develop. For those investors that elected to sell all or a portion of their remaining NAV, a second continuation fund is formed, where Greenspring’s investment, in addition to that of our broader syndicate, will provide the capital necessary to acquire these interests. Finally, to properly reserve for future financing rounds or preserve the ability to acquire larger positions in the remaining companies, a third fund was formed with committed capital provided by Greenspring and its syndicate. It is important to note that a tender offer does not always occur concurrently to the formation of a continuation fund. A second example demonstrates this concept. As reported in Secondaries Investor, TPG Asia executed a tender offer transaction in December 2018 involving TPG Asia Fund V and TPG Asia Fund VI. This tender provided liquidity to investors in the existing funds, with the secondary buyers simply stepping in to replace the selling LPs. A third and final example highlights the concept of an asset strip sale. In November 2018, as reported in the Wall Street Journal, New Enterprise Associates (“NEA”) sold its interests in 31 portfolio companies across several funds. The interests were then transferred to a new venture capital fund, NewView Capital. In this transaction, LPs in the existing NEA funds were given the opportunity to invest in the new fund to continue to gain exposure to the companies under fresh economic terms, including carried interest and management fees paid to NewView Capital. Why are managers promoting early liquidity options? While there are a number of fundamental drivers fueling this early liquidity fire, we have discovered through conversations with our managers that some are more prevalent than others. First, companies are staying private longer. This results in larger demand for follow-on capital and longer hold periods to fully capture upside return potential. 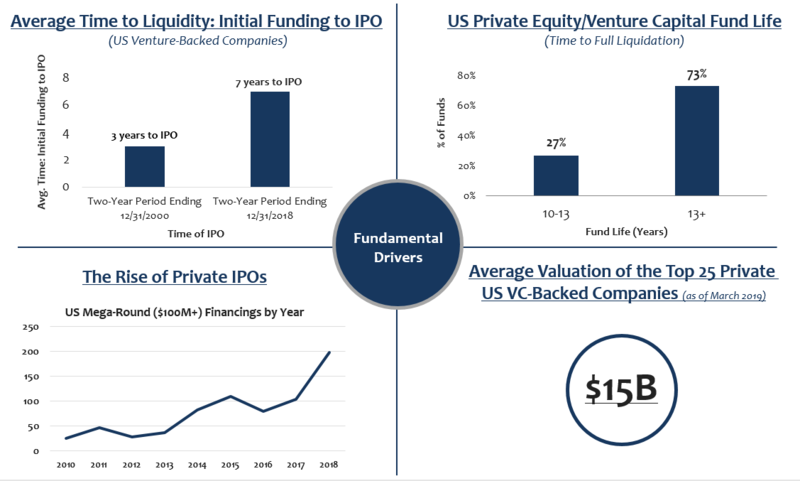 The chart below, which highlights these dynamics in greater detail, shows that during the two-year period ending December 31, 2000, the average time to liquidity in the venture capital industry was about three years. In the last two years ending December 31, 2018, that number has ballooned to seven years. This, in turn, has resulted in over 73% of venture funds needing at least thirteen years to fully liquidate their partnerships. The existing fund construct, which has remained largely unchanged from the beginning of the modern venture capital era, was not built to sustain the capital needs of today’s companies. Early liquidity options help to bridge this divide. Second, managers are seeking ways to further engage their existing LP base while also building relationships with new strategic partners. The solutions outlined in the prior section involve partial to complete turnover in the investor base and a realignment of interest among the remaining investors. Realignment provides an opportunity to reengage longstanding investors, while also allowing those who prefer a return of capital to divest in an amicable fashion, maintaining the potential to invest in a manager’s future fund iterations. A turnover in the investor base provides the opportunity to bring new, strategic investors into existing high-performing assets, a unique way to build relationships with LPs who could become meaningful, value-added primary investors in the future. Lastly, managers are increasingly considering these transactions as avenues for succession planning and firm management. With additional tools for liquidity, GPs can realign the economic incentives with those individual partners most closely associated with managing companies going forward, who will be responsible for their future growth. Why are LPs interested in participating in these transactions? Investors have a desire for liquidity, and the current environment has evolved such that full exits may not be occurring quickly enough for all LPs. Through a large-scale restructuring event, multiple investors are given the opportunity to rebalance portfolios and crystalize returns with little inconvenience. Source: Nasdaq Private Markets, ThomsonOne, and Pitchbook NVCA Venture Monitor. Given the range of liquidity options and the driving forces behind the need to transact, how do you actually execute the deal? Once a GP has clearly identified its goals and the goals of its existing investors, the next step is to select the most appropriate transaction structure, factoring in the intricacies specific to the situation. To assist in this process, the GP engages partners in the form of an advisor, a well-qualified lead buyer, or both. For example, in the case of the two restructurings we are in the process of closing, one of the two features a highly experienced advisor, the other does not. The advisory role has continually evolved towards specialization; consequently, individual advisors are better equipped to administer certain transaction types relative to others. Furthermore, advisors are customarily engaged in larger transactions, where the NAV position and expected selling volume is sizeable enough to warrant the associated advisory fee, leaving a void in the case of smaller transactions. This is more typical in venture capital, where fund sizes are often smaller in comparison to their buyout counterparts. Buyers have similarly evolved towards specialization, resulting in a limited set of purchasers for each asset class and transaction type. This dynamic is particularly prevalent in venture, due to a lack of profitability of the underlying assets and limited access to information, making it difficult for non-venture focused investors to conduct an accurate underwriting process. To more thoroughly understand each buyer’s role, it is helpful to subdivide them into two classes: a lead investor and the co-investors. A syndicate member's role often begins and ends with providing capital. The lead investor, however, has a much more active role in collaborating with the manager to create a tailored solution. The lead proposes the terms, price and structure of the transaction. These terms are later accepted by the GP and ultimately approved by the LPAC. But let the buyer beware – as John F. Kennedy once said, “In every case power and responsibility must go hand in hand.” Serving as the lead investor in a large-scale fund restructure is complex and requires a high degree of both time and knowledge of underlying portfolio assets and fund vehicle structuring to complete. As a result of these challenges, not all buyers are capable of leading and instead either participate as a more passive co-investor or lose the ability to participate altogether on the occasion that the lead consumes the deal in its entirety. How can Greenspring help? With over 70 employees, Greenspring has one of the largest teams exclusively dedicated to the venture capital asset class. Our established network and venture-only focus provides exceptional access to information in an environment wrought with information asymmetries. We have substantial experience leading GP-led transactions. Through these experiences, we have gained the knowledge necessary to help guide managers through the process of finding a mosaic solution to fit the unique facts and circumstances surrounding the needs of both the managers and the investors, while providing for outsized returns to the constituencies involved. We firmly believe that GP-led secondary transactions will be a large investment opportunity, and we look forward to partnering with our managers in this new and exciting segment of the venture ecosystem.